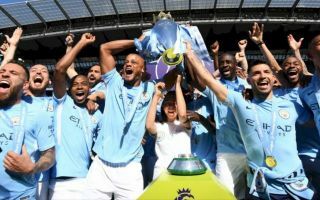 The 2018/19 Premier League season kicks-off on August 10 and the ‘Big Six’ clubs look set to dominate once again. Manchester City will be eager to defend their title, but the likes of Manchester United and Liverpool are expected to mount stronger challenges this time around. Chelsea, Tottenham Hotspur and Arsenal also can’t be ruled out of the running, but who will come out on top? Read on as we take a look at each club’s chances of winning the league. All the leading betting sites make City odds on favourites to win the league again and it is easy to see why. Pep Guardiola’s side finished 19 points ahead of United last term and the addition of Riyad Mahrez from Leicester City boosts their attacking options even further. City perhaps need one more midfielder player after being beaten to Jorginho’s signature by Chelsea, but the reigning champions are the team to beat again. For all of manager Jose Mourinho’s posturing about the club’s summer transfer business, United are probably one top class centre-back away from having a squad capable of challenging for the title. Fred is an excellent signing in midfield and if Paul Pogba repeats the form he showed for France at the World Cup, United should be in the mix. Tottenham boss Mauricio Pochettino has insisted that he isn’t worried about the club’s lack of activity in the transfer market, but he should be. All of their rivals have strengthened and Spurs could find themselves under big pressure from both Chelsea and Arsenal for a top four spot this season. Liverpool have invested heavily in their squad, spending over £175 million on Alisson, Naby Keita, Fabinho and Xherdan Shaqiri. The Reds look a top-class centre-back short of potential title winners and the fact that manager Jurgen Klopp says he is not going to add one to his squad could come back to haunt him. The Blues could be the ones to benefit most from the lack of transfer activity at Spurs. Jorginho is a quality addition in midfield and new boss Maurizio Sarri can be expected to add more new faces before the transfer window closes. A title bid will probably be beyond Chelsea this season, but a top three finish isn’t out of the question. It’s a new era at the Emirates Stadium following Arsene Wenger’s decision to step down as manager at the end of last season. New boss Unai Emery has addressed many of the issues left behind by Wenger and they should be much improved this term. Top six predictions: Man City, Man United, Chelsea, Liverpool, Arsenal, Spurs.